Along with offering superior quality rooms and facilities, Hotel & Suites Le Dauphin Quebec is recognized for its excellent customer service. Our team of professionals devote themselves to exceeding our guests’ expectations by meeting their every need with a smile. Owing to our high standard of service, our Quebec hotel has received awards on a regular basis by everyone in the hotel business. Learn more about our most recent awards! Our best reward is your satisfaction! The team of our hotel in Quebec city is waiting for you. We have won the prestigious TripAdvisor Certificate of Excellence five times. An award recognizing excellence in hospitality, TripAdvisor Certificates of Excellence are awarded to hotels that are the most highly rated by travellers on the TripAdvisor website. Only 10% of the most highly rated establishments on this site receive this prestigious award! 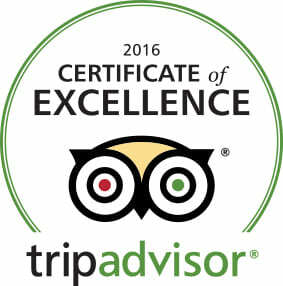 How is the TripAdvisor Certificate of Excellence awarded? To receive this award, the average rating given by travellers for the hotel on the TripAdvisor site must be 4 out of 5. The hotel also has to be tracked on the site for at least 12 months. The number or ratings received in the past year is also taking into consideration in the award criteria.